Start your game on a fictional map of Europe as a small realm fighting for space, or on a random map with historical analogues for the great kingdoms of yore. Join a Pagan warrior lodge and raid your way up the ranks, unlocking access to powerful allies and greater military skill. Descendants of great warrior heroes will have bonuses that match the accomplishments of their forefathers, including historical bloodlines of Charlemagne, Genghis Khan and others.. Try to win a reluctant vassal through charm and persuasion, or provoke someone you want to push into conflict. Pious Catholics can become canonized, passing on their glory to their descendants and making their resting place a site of great value. Feudal kings and emperors must find clergy to crown them, since all power descends from the heavens. 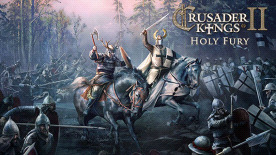 Deeper gameplay for the religious wars of the era. A Pagan Elder Council may have the final word in how a realm is divided among heirs, or a ruler may challenge his brother to combat to unify a realm. Changes to religion, custom names for people or objects, deeper baptismal mechanics, lists of people you've killed, and other small changes for flavor and variety.